It’s the final week of spring term and year 1 have been busy learning as usual. In RE, pupils have been learning what Easter means to Christians—the crucifixion and resurrection of Christ. Also, the importance to other faiths too. In English we have been learning about alliteration, similes and rhyming so that we can write our out shape and acrostic poems. In maths we have been having fun investigation volume using water and different size containers. Yesterday, we had lots of fun making and decorating out Easter baskets—lots of mess! We hope you have a safe and relaxed Easter break and look forward to seeing you in 2 weeks. This week in English we have been preparing to write a poem. We are beginning to recognise rhyming words and learning all about alliteration.We have been writing extended noun phrases about dancing dolphins and hungry horses! In Art we have used our science theme of plants to paint our observations of leaves. In maths we have been working with coins and looking at whether the size of the coins means that it has the highest value? In English we have been learning to write a letter from Amber and Monty's point of view telling their parents how they feel using emotive language. In Maths this week we have been comparing values using 1:1 and familiar structures to find the difference. Today we completed table on how many children liked certain fruits. To finish the week we had our amazing ‘Words in the Wood’ exhibition. Parents came and looked at our display showing the stores that pupils wrote based on Nick Butterworth’s book ‘The Whisperer’. It was also 'Crazy hair day' and children came in with very creative hairstyles - thank you for the fantastic effort and the £1 donations. We hope this blustery weather turns into sunshine and you have a safe weekend. Year 1 Spelling, Week 2, Friday 8th March 2019. What a fun and exciting second week back. We dressed up for world book day and today we had a visit from the author Nick Butterworth. The whole school has been studying ‘The Whisperer’ and year 1 have been using the story to write their own amazing versions. Photo’s below. In Maths this week we have been learning the language of problem solving and investigating bar models and whether the whole or the part is missing and maths vocabulary, which is more and less. It’s the last week of this half term and ‘Feel Good’ week. Pupils have been dancing and working on what makes them feel good and looking after themselves. Pupils participated in a toy making workshop and made toys using push, pull and gravity. In English we have been writing and editing our work about our own character. In Maths, children have been learning to balance numbers and number bonds to 20. Keep safe and see you in a week. In English we have been writing thought and speech bubbles using exclamation marks and questions marks. Also, we have been planning to add our character to Traction Man, adding adjectives to describe the character and setting. In Maths, children have been learning to ‘think 5’ and ‘think 10’ when adding 2 digit numbers. In Science, we carried out an investigation into which material would be suitable for an umbrella for Teddy. On Wednesday it was ‘Safer Internet Day’ and in groups, pupils made posters of how to keep information safe. We had some very excited children this week because of two days of snow. However, the learning carried on and in English we continued with Traction Man and children wrote speech bubbles to show what the characters were thinking. We also practised sentences ending with an exclamation mark! In Maths, children have been learning days of the week, months of the year and seasons. In History, we made our own toys and played with them, just like children did in the olden days. Have lots of fun in the snow this week-end. In English this week we have been reading Traction Man by Minni Grey. Children have been sequencing the story and composing sentences using nouns and verbs. Children then wrote their own sentences to describe their favourite super hero. In Maths, children have been learning about ordinal numbers and days of the week. We have talked about the things they do on certain days of the week. In History, we are continuing with the toys theme and learning to recognise the similarities and differences of toys from a long time ago compared with today’s toys. In Science, we sorted objects according to whether they are man made or natural materials. Year one pupils have been working hard during the second week of Spring term. In English, we have been learning how to write instructions on how to make a teddy bear using bossy verbs and adverbs of time. As a class we wrote instruction on how to prepare for lunchtime. Pupils enjoyed being bossy! In Maths, we raided Mrs Leach’s food cupboard, to compare items and identify which were the heaviest and the lightest. Later on in the week we learned how to describe a car race - which was the fastest or slowest car and which car came second. In History, we learned to compare toys from the past to toys that pupils play with today. In Science, we investigated different materials that we could find in the classroom – paper, metal, wood, fibres, plastic, rubber and glass. The highlight of the week was a visit by GB gymnast, Laura Mitchell. She demonstrated some of her amazing handstands and back-flips. Year 1 pupils also showed their gymnastic moves by doing star jumps and burpees. Thank you for your contributions. Welcome back to school and the Spring term! We hope you had a lovely Christmas. We have had a really lovely first week with Paddington and Winnie Class. The week we have been working hard to complete different learning tasks. In English, we have been writing a description of a ferocious animal using extended sentences. Children brought in their favourite toys for topic work and described the toys which led to them creating their own questions. In PSHE they learnt about how important it is to wash their hands regularly to get rid of those nasty germs! Homework grids have been sent home today for this half term. May we remind you that children are expected to complete a minimum of 4 activities. Thank you so much to all the children who have brought their lovely homework in today. If you have not yet brought it in, please make sure it is handed in on Monday so it can be marked before the end of term. This week we have enjoyed taking part in the Key Stage 1 production of Straw and Order. We hope you agree that the children did fantastically with their singing and have done an amazing job learning the words to the tricky songs. We are very proud of the children for the work they have put in. We also hope you enjoyed visiting our Christmas Fair on Saturday, we have raised a lot of money that will be a great help in buying our school things for the children to enjoy. Thank you to all the adults who came to help, who brought their children in to visit the fair, and who contributed to organizing all the activities, raffles and games. We have continued our work with The Gingerbread Man in English. The children have written a wonderful start to their own version of the Gingerbread Man. Next week, we will be writing the middle and end. In Maths, we have been looking at numbers to 20 and have started looking at shape. There are no spelling words for next week, we will start our spelling words again in the next term. Homework is due on Friday, 14th December. Children should have four or more completed pieces of work. The homework grid can be found below. This week in English we have been working on The Gingerbread Man. We looked at the character of the Gingerbread Man and came up with different ways to describe him. The children have also sequenced the story as part of a team. The children have created their own character, illustrated that character, and wrote them into the story. If you ask your child about their character, they have been very excited to write about it and would love to tell you. This week in Maths we have been working on numbers to 20. We have used different resources to make these numbers, and talked about place value. We have also done some work with estimating and talked about how it's making a very good guess instead of counting. Here are some maths links that you can explore with your child. On Wednesday, we had Aladdin performed in the hall for all children. It was a lovely show full of laughter and so many amazing children participated. Next week we have our Christmas shows. Please ensure you send the form and money in if you would like tickets. Children will also need a Christmas jumper if possible, or red or green clothing if they do not have a Christmas jumper. This week in English, we have continued our work using the story, Naughty Bus. We acted out own version of the story before writing the middle and ending. In 1 Paddington’s story the Naughty bus got stuck on a trampoline before being saved by a friendly dinosaur. In 1 Winnie’s story, the Naughty Bus was picked up by a cat and dropped in toothpaste under a bed before being rescued by a monster truck. Next week, we will be looking at a different book. In Maths this week, we have started looking at teen numbers. We have practiced making numbers larger than ten using lots of different resources, we have talked about the clues in number names telling you what they are made of, and we have practiced counting in 2s, 5s, and 10s. Our spelling test will be on Monday, spelling lists can be found below. This week in English, we have been reading about the Naughty Bus. We have; listened to the story, sequenced the story, acted out the story, made a story plan and written the beginning of the story. Next week, we look forward to writing some different adventures for our own Naughty Bus. In Maths this week, we have looked at lots of different ways that we can balance number sentences, (3 + 4 is the same as 5 + 2) number bonds to 10, and at how we can look at the link a number has to either 0,5 or 10 to help us with our maths. This week, it has been Road Safety week. We have talked about how we can be safe around roads, how we can make sure that we cross the road safely and have talked a little about how to be safe on a bike around roads. As part of Road Safety week, the children have designed their own Cycling helmet. Please can you double-check that P.E. kits are not at home after half-term, as some children have not brought them in yet this half-term.. Please also make sure that your child has a track suit as we do have P.E. outside all year round unless the weather is hazardous. Please note that the next spelling test is MONDAY, 3rd December as next week is only a three day school week. At the beginning of this half term, children were given their home learning grids to bring home. If you have not received one, please ask us or see below. Home learning grids are to be handed in on Friday, December 14th. According to the school home learning policy, children must complete at least 4 pieces of homework by this date. We look forward to seeing all the lovely work children complete over this half term. Thank you! This week in English we have been focusing on Anti-bullying week. We read “I’m Number One!” By Michael Rosen and Bob Graham, which is about a very unkind toy. We have done lots of work with being kind, how to do a good friend, and our promises to make Summerswood a bully-free zone. The children have written acrostic poems, created anti-bullying posters, written about how they are going to be good friends to each other, as well as other work throughout the week. In Maths this week, we have done some work with difference and understanding difference as a distance between two numbers, and the concept of being equal. We have played a math game about difference. We have been using number lines this week to help with understanding difference, and the children have also measured objects with multilink cubes to see what the difference between them is. Friday, 16th November was a onesie and PJ day for Children in Need and Diabetes. Thank you so much to everyone who donated. As a school we raised over £400 for Children in Need, that’s amazing! Welcome back! We hope everyone had a lovely half term break. This week in English, we have been working on Sparks in the Sky, which is a story about November 5th bonfire night and fireworks. Students have worked on predicting what would happen in the story, writing a poem using adjectives and their five senses, sequencing the story, and writing sentences to describe what happens in the pictures. In Maths, we have been working on problem solving with addition and subtraction, with a focus on finding lots of possible answers to open questions. For example, how many different numbers can I find that have a difference of 2? In History, we are learning about changes in living memory. Thank-you to those of you who sent in photos of your children as babies and a family portrait. The children have drawn their families in age order, and we have talked about how they have aged and will age. This week in English we have continued looking at Funny Bones. This week we have worked on our own version of the stories in our classes. In Paddington class, the skeletons visited the aquarium whilst in Winnie class they visited the trampoline park. Please ask your children about their stories as they should be very proud of the work they have done. Today in Winnie class we had our Marble treat. The children earn marbles for good behaviour and choose a treat when the jar is full. We chose to watch a movie in class while wearing our pajamas. We voted to decide which Winnie the Pooh movie we would watch, and decided on The Tigger Movie. 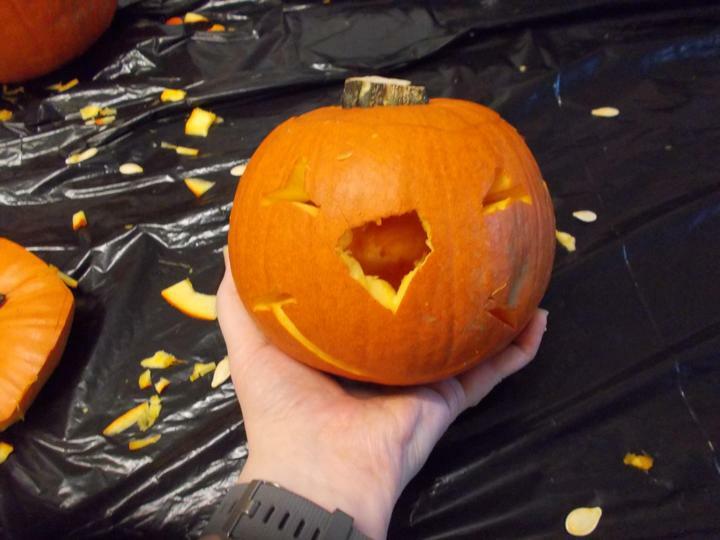 We also had pumpkins to carve, so we talked about how the pumpkin looks and feels inside, and what equipment is best for clearing it out. We tried several different kinds of spoons and kitchen tools. We talked about being safe when using sharp tools and why I was the only one allowed to use the knife. 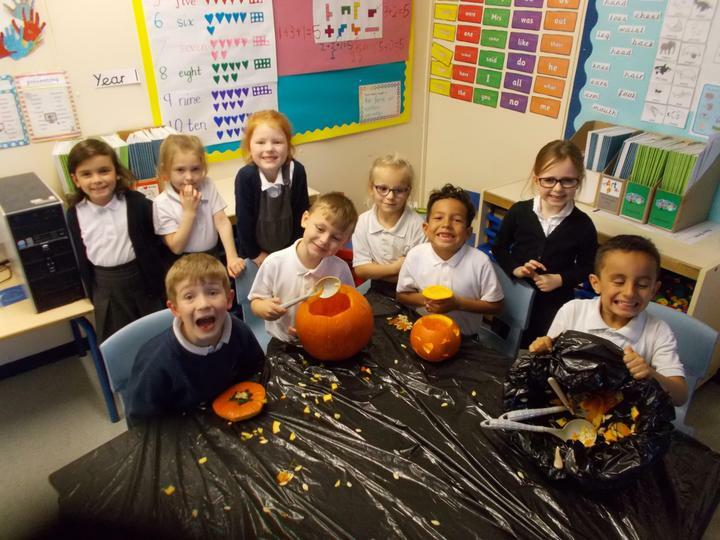 The children had a really lovely time cleaning out the pumpkins and carving them. Attached are a few pictures. Paddington class are very much looking forward to having their marble treat soon, as their jar is very nearly full! We hope everyone has a lovely half term! Today as part of Black History Month, we had a visit from Thabani! The children had a fantastic time listening and participating in storytelling and several dances. This week in English, we have continued working on Funny Bones. We have worked really hard on writing the story and have planned our own version that we will be finishing next week. Please remember that we have Open Morning on Wednesday morning from 9-9:30. We look forward to seeing as many of you as possible. Thank-you to everyone who has already handed in their homework. If you have not handed in homework yet, please bring it in on Monday, along with your spelling book. Spelling lists for this week can be found below. In Maths, this week we have been working on regrouping and representing numbers using different mathematical models. We're really sorry that Spelling Group 2 haven't received their spelling test books back today, they will get their spelling test books on Monday. Please can we have all spelling test books returned to school by Thursday in preparation for our spelling test on Friday. We are still waiting on a lot of the childhood photos (a baby photo and a family photo) from many children. If you have not sent it in yet, please do send it as soon as possible as we cannot teach our history lessons without them. Thank-you to those who have already sent them in. Please note the homework is due next Friday, October 19th. This week in English we have been working on What the Ladybird Heard. We have done a lot of work with adjectives. We talked about how we use adjectives to describe things and how adjectives help us know more about things. In Maths we have been working on number knowledge, greater and fewer, ordering numbers and sequencing. Here are some links you may wish to explore with your child to help them gain a greater understanding of number. Please check that your child's PE kit is in school. We have attached the spelling lists for this week below. Children should be practicing their spellings regularly during the week in time for their spelling test on Friday. As a few parents have been asking, please note that homework is not due to be handed in until Friday the 19th of October. We are having an Open Morning on Wednesday, 24th of October, from 9-9:30am. For those of you who are new to Summerswood, this is where we invite parents into their child's classroom to look around and to see the homework which the children have completed this half term. This week in English, we have been looking at the Three Little Pigs. We imagined what we would build our houses out of if we were the fourth little pig, we talked about how the characters would be feeling, and we have retold the story. In Maths, we have been working on making numbers using different resources, matching objects to numbers, numbers greater and less, and one more and one less. Spelling lists have been sent home. Spellings should be practiced each night. The spelling test will be on Friday. There are three groups for spelling. Children should know who they are taught phonics by (it is not necessarily their class teacher). Spelling lists can be found below. Just a reminder that you should be completing another homework task this weekend. The work can be presented however you wish, but the folder should not be returned until the week before half term. This week in Maths we have been working on recognising numbers. The children have been making sets of objects to match a given number and working on writing their numbers clearly. We are learning on recognising that numbers can be represented in different ways. In English, we have looked at letter formation, capital and lowercase letters, writing labels, and using phonics for spelling. In Science, we have started looking at the human body and our five senses. If you have not already sent your child in with a photograph of themselves as a baby and of them and their family, please could you do so next week. We will start sending spelling lists home next week. Please note that homework is due the week before half term.